I was going to hold off on these till tomorrow but there so pretty I could not wait, I have a nice little exclusive treat for you all tonight with additional 37 outtakes from the photoshoot Scarlett did with Variety last year. Please feel free to use them but give credit back and if you make any art I would love to see. When Scarlett was at the Vanity Fair Oscars Party, She and a lot of over celebrities took part in a Portraits photoshoot for the event and one photo of Scarlett has now been released, I am hoping more come out as Scarlett looking amazing in it. Thanks to Mickey for donating a new photoshoot of Scarlett. It was shot by Frank Sun in 2014. Enjoy! I added tons of new photoshoots to the 2013 and 2014 section of the gallery. Check out additions below by clicking the links. She’s dealt with constant criticism over the years about her body, and now Scarlett Johansson is ready to reveal her true thoughts on the matter in the Spring 2014 issue of Dazed & Confused magazine. The “We Bought a Zoo” beauty donned designer duds from Carl Manzi and Saint Laurent for the Benjamin Alexander Huseby-shot front page while opening up about her famous “womanly” curves. SodaStream has named Scarlett Johansson as its first celebrity ambassador but will that be enough to get SodaStream pop up again soon? Her voice made Joaquin Phoenix’s character fall in love with her in the movie “Her” and Esquire magazine fell in love with everything else about her. Now 28 year-old Hollywood superstar Scarlett Johansson is being cast in Super Bowl ads for SodaStream. The home soda maker is hoping that Johansson, as their first-ever “celebrity ambassador”, will drive up sales significantly. That’s something they very much need at the moment. On Monday, the company lowered its fiscal 2013 guidance after holiday sales came in lower than expected. That’s sent shares down 25% shortly after the announcement. I added a few pics to the album of the Esquire shoot Scarlett did for the November issue. Check them out by following the links below. Taking their beauty from the big screen to the pages of a magazine, Scarlett Johansson and Lily Collins feature in the September 2013 issue of Harper’s Bazaar. Styled by global fashion director Carine Roitfeld, the fashion portfolio is entitled “Singular Beauties” and also includes Dakota Fanning, Zoe Kravitz, Gaboure Sidibe, Karen Elson, and more. Scarlett Johansson rocks a sheer floral dress on the cover of Marie Claire‘s May 2013 issue, on newsstands April 16. 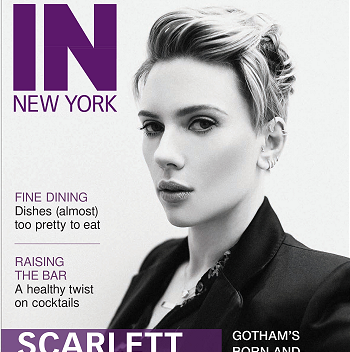 For more from Scarlett, visit MarieClaire.com!